Working with RFA we produced a suit of exhibits explaining all elements of commercial vehicles. They include how the different types of Engines work. How to change a tyre and the purpose of the fifth wheel. 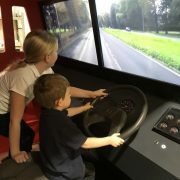 Sitting in the full size cab Children have a immersive driving experience around the local area. 26 years after working on the original development of Eureka! 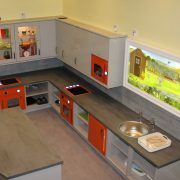 Aivaf were asked to help redevelop the highly interactive Kitchen area. Another extremely successful and enjoyable experience working with the Eureka! team. Great project, Great Team, Great place…..